Details Emerge Of Las Vegas Shooter's Real Estate Gambles : The Two-Way Las Vegas shooter Stephen Paddock was involved in nearly a dozen deals over the past three decades, starting small with apartments, then working up to multi-million dollar properties. 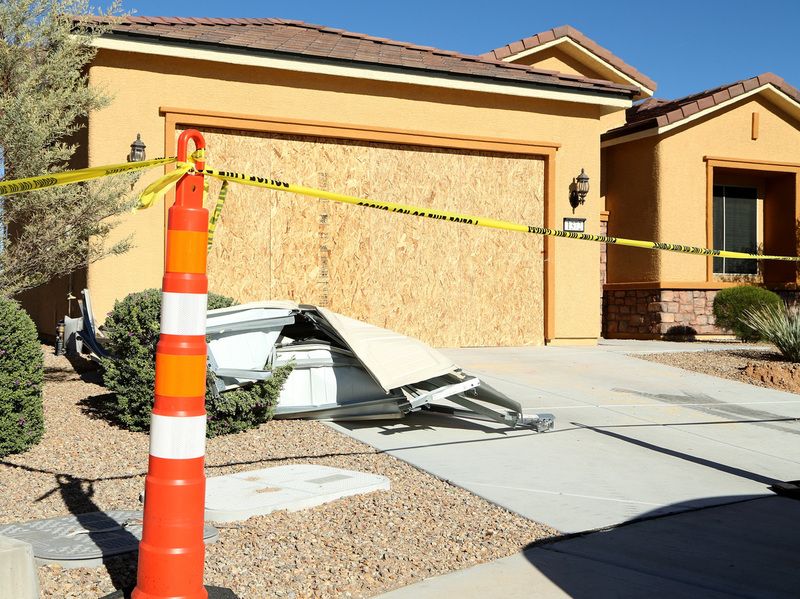 Remains of the garage door sit in the driveway at the house where Las Vegas gunman Stephen Paddock lived in the Sun City community in Mesquite, Nev.
As more details emerge about the life of Stephen Paddock, one thing is clear: on paper, he does not appear to fit a typical profile of a mass shooter. The 64-year-old former accountant who carried out the deadly massacre in Las Vegas on Sunday night was a successful real estate investor who stayed in touch with family and took care of his mother. He was a gambler, but not a reckless one. It appears Paddock liked to have a strategy. Over the past three decades, Paddock was involved in nearly a dozen real estate deals. At first, he invested in small apartment buildings, but gradually moved into upscale multi-million-dollar properties. He appeared to make money on most of these deals, but he wasn't immune to losses. Paddock appears to have started his real estate investments in November 1985 with the purchase of a modest house in Los Angeles on El Paso Drive. Two years later, with the help of his mother, he bought a small apartment building, also in Los Angeles for $725,000. Apartment buildings became a collector's item for Paddock in following years, with a property on Kornblum Avenue in southwest Los Angeles County and another on Doty Street in Hawthorne, Calif. He began to sell them off for profit in the early 2000s, with four sales in 2004 alone. He may have been preparing for what would be his biggest deal, a multi-story apartment complex on the north side of Mesquite, Texas, not far from the municipal golf course. Paddock borrowed $3.5 million to buy the property and sold it eight years later for $4.6 million. There were also single family home purchases along the way. A home in California City, Calif., was bought in 1995 for $57,000 and presumably flipped a year later for $89,000. A home Paddock bought in Mesquite, Texas, in 2004 was later transferred to his mother at a sales price of $159,375. She apparently lost money when she sold it in 2014 for $150,000. When his mother wanted to move to Florida, Paddock bought a brand new home for her in Melbourne. At least, that's what he told neighbor Don Judy. This one was another loss: purchased for $246,000 in 2013 and sold two years later for $235,000. Paddock's most recent purchase appears to have been a house on Babbling Brook Court in Mesquite, Nevada. He paid $369,022 for it in January 2015. It would be his final real estate purchase.